We all know how much birds enjoy feeding at our bird feeders, and some benefit greatly over winter and spring from the food human provide. At this time the food is at the lowest and birds that do not migrate south will come every day to check at your yard for a meal. If you want to feed your bird friends all year round it is important to keep bird seed in a safe and dry place. I have decided to review some of the bird seed containers for sale, and see what is the best you can get for your money. This bird seed containers are made of plastic and each features an air tight seal. This is great to keep out ants, rats and other animals. The seal is great of preventing moisture ruining your seed and keeping it dry year-round. You can easily see true the container bodies and check your seed level, and will hold 40 pounds of bird food. The smaller one container will hold 10 lbs of seed. You will get a food scoop with measurement markings so you can know how much food you are taking out. What I like about this bird seed containers is a that it is designed with wheels. This is great if you want to move the containers, because they can get heavy if full to the top. These containers are perfect for storing seed indoors, balcony, and patio. It keeps the smell in and the unwanted visitors out. You can easily use it for other type of food if you have dogs or cats. It comes in red and black color. 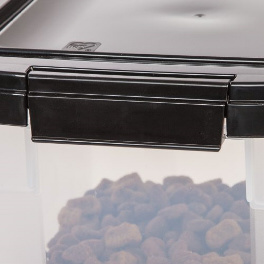 Check IRIS 3-Piece Airtight Pet Food Storage Combo, Garnet Red Here! 8-quart is great for wild bird foods and sunflower seeds. It is is handy for thistle seed (Nyjer) and finch mixes. No bugs! No spills! No mess! This bird seed containers are made of sturdy plastic, and are air tight to prevent moisture from destroying your seed, and to keep ants and rats out. What I like about this design is that it is made with an in-bag feature. That means that you just put your original bird seed bag in the container, and in this way dispense the seed out. This is a welcome feature as you will not spill the seed while transferring from the bag in to the container, and will minimize your mess. You will get a large container together with one small dispenser. The smaller one is great for keeping old seed after you refill the larger one. Just transfer the old seed in the smaller one, so your bird seed always rotate and newer spoil. It is very well designed and great for indoor as well as outdoor use. The rats and larger birds will not penetrate the container and it keeps the smell in. I like the fact that when you put the bag inside you can still read the label and nutritional values. You can keep bird seed mix, nyjer seed, sunflower seed, and other kind in this bird seed containers, if you have other pets it can be used for dog or cat food also. It will keep your seed dry and safe all year-round so you can attract those little fatherly friends to your back yard or balcony. In my opinion you get good value for your money! 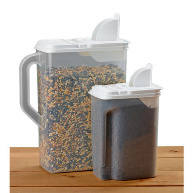 Check Buddeez 8 and 4-Quart Double-Pack Bird Seed Dispensing Set Here!